What GREAT COLOR! Check out this color-blocked maxi skirt by ASOS. I would wear it exactly as shown – a simple black top or tank and black flat sandals. I’m usually afraid of mixing pinks and reds but have no issue with this piece. And for $50, you can’t go wrong. Here’s a black tee for $16 from the GAP. They are having a 30% off sale today – so it’s even cheaper. 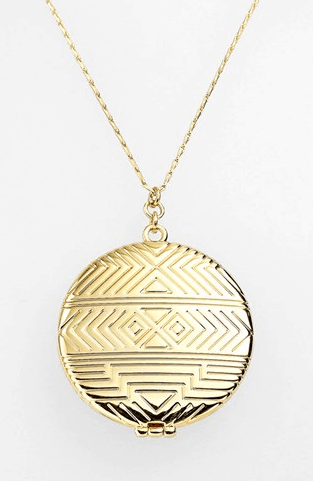 And I would add a necklace like this pendant piece from House of Harlow 1960. Just enough. Retails for $58.